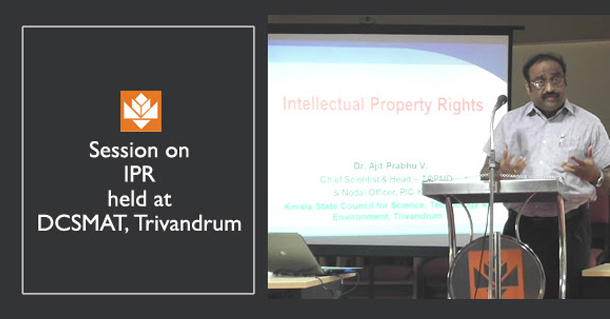 A session on Intellectual Property Rights was conducted at DCSMAT Trivandrum on 11th April 2019. Dr. Ajith Prabhu V, Chief Scientist of the Kerala State Council for Science Technology and Environment (KSCSTE) under the Government of Kerala and also head of the Technology Development and Project Management Division briefed on the importance of IPR in a technologically driven world. He highlighted the relevance of IPR with practical examples of IPR related issues from the past as well as the contemporary world of business and innovation. The talk stressed on the necessity to be qualified in IPR which could be easily done by an online course conducted by WIPO. He shared important procedures for practicing managers and tackling the inefficiency in administration of the IPR regime in organisations.